The Motion-Sensor Bomb in SSB4. 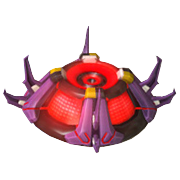 The Motion-Sensor Bomb (センサー爆弾, Sensor Bomb), also referred to as Proximity Mine in PAL versions of Super Smash Bros. Melee, is an item seen throughout the entire Super Smash Bros. series that will attach itself to the nearest solid part of the stage when thrown, be it ground, wall, or ceiling. It will then stick there until something hits it, be it an attack, a character or an item. If touched, it will explode and deal out a great amount of damage and knockback. The Proximity Mine as it appeared in GoldenEye 007. The Proximity Mine as it appears in Perfect Dark. In GoldenEye 007, there is an item called the "Proximity Mine". The player simply throws the mine on any surface and waits for the enemy to walk by it. If the enemy gets too close, it explodes and causes powerful splash damage, enough to easily kill the victim. It is also possible for the same person to be killed by his or her own Proximity Mine. In SSB and Melee, when lying on the ground after spawning, it will be grey, but once thrown onto a wall or floor, it will glow green, as well as make its signature noise when it hits the ground, alerting others of its presence. In Brawl, the mine no longer glows; however, it gives a small beeping noise shortly after it has been deployed. It will also disappear if it takes too long to be set off. In SSB and Melee, the mine cannot explode before it is armed by a player. This was changed in Brawl and in every subsequent game, attacks and stage hazards will automatically cause an unarmed mine to explode, making them more dangerous in general. In the North American and PAL versions of Melee, beta gameplay shows that the item was to look more similar to its appearance from Perfect Dark rather than GoldenEye 007. This was changed in the final versions for unknown reasons; even the Japanese language option in the North American version does not revert the item to the same appearance as in Perfect Dark and the Japanese version of Melee. In Ultimate, the Motion-Sensor Bomb triggers the game's special slow-down zoom effect when someone sets it off, regardless of if it will KO anyone. It gives off a signature beep during this slow-down, before exploding when speed returns to normal. Note, in Brawl the Motion-Sensor Bomb cannot be dropped while on the ground, pressing the drop input will make the character perform a forward tilt throw. 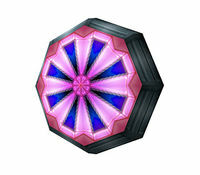 The perfect accessory for ambushes, the proximity mine has long been a favorite covert weapon of the Carrington Institute any surface [sic], and once armed, detonates with incredible force when it detects motion within its range. In the frantic world of Super Smash Bros., it doesn't take long for it to go. The perfect accessory for ambushes, the Motion-Sensor Bomb has been a favorite covert weapon of spies and other stealthy operatives. It adheres to any surface, and once armed, detonates with incredible force when it detects motion in its range. In the frantic world of Super Smash Bros., it doesn't take long for it to go. An item that, when placed, will detonate when someone gets too close. It can be stuck on ceilings, walls, and floors. It doesn't matter who places this thing--it'll explode regardless of who passes by. Its explosive power is high, and it launches players with ease. It's small and lies almost flat on surfaces, so it can be very difficult to see. A tiny bomb that explodes in a big blast when it detects movement. Stick it to the walls, floor, or ceiling, and wait for it to arm. Long-range weapons can destroy it, but only if your opponents remember it's there. Don't forget yourself, though, or it'll be you caught in the explosion! This little bomb might not look like much, but it's primed to explode when it detects movement, and it packs a serious punch! You can stick it on walls and ceilings, and it can be detonated by long-range attacks. With just a little bit of strategy, you can do a LOT of damage! The new Motion-Sensor Bomb in Smash 4. The underside of the bomb in SSB4. Despite the Proximity Mine's trophy stating that its origin is "TOP SECRET," Perfect Dark can be seen in Melee's credits in the PAL version. "Motion-Sensor Bomb" is a word-for-word translation of the name given to the Proximity Mine in the Japanese release of GoldenEye 007. This page was last edited on March 11, 2019, at 23:23.